As an individual, Stan Laurel often played belligerent, highly-physical characters eager to spoil for a fight - quite a departure from the milder persona he would later contrast with the overbearing Hardy. He’d been having combative relationships off-screen as well, going back and forth from working for Hal Roach to leaving him again temporarily for producer Joe Rock over a money dispute. 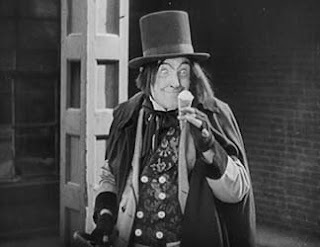 During a prolific burst of creativity churning out twenty-four shorts across 1924 to 1925, one of the twelve he made for Rock was another direct spoof of the various versions of Dr Jekyll and Mr Hyde. 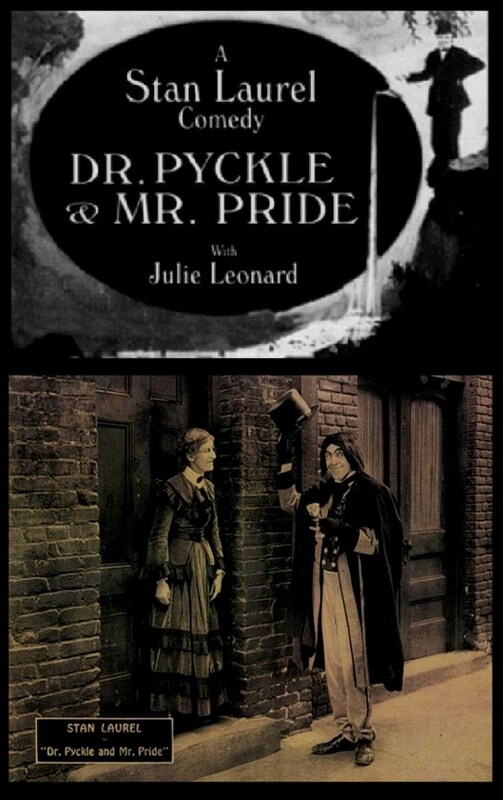 Dr Pyckle and Mr Pride is a surprisingly funny and exuberant gem. Part of the fun is the wit of Tay Garnett’s many title cards undermining both the period and the characters from the novel with a modern subversiveness. Author Robert Louis Stevenson’s meditation on the fear of evil overcoming good, echoed in the 1920 film’s ‘In each of us,two natures are at war – the good and evil’ - is here considered with such repercussions as ‘Even saxophone players would be tolerated’. Dr Stanislaus Pyckle’s high reputation precedes him – ‘Heaven knows why’. We then meet Laurel’s Dr Pyckle pacing the floor of his laboratory while a quartet of learned colleagues hang on his pronouncements, apparently bored, awaiting his divine inspiration. His pince-nez glasses, slicked-back hair and dark lips contrast starkly with his blue eyes. Even more striking than his appearance is the rare chance to see Laurel taking a high-status role. He is a strutting peacock of Victorian intellectual pomposity, not the famously meek dimwit we love. The main pleasure of the film is actually watching Stan clearly enjoying himself in the dual title role wherein he’s equally funny as both halves. Whereas Lloyd, always a serious actor playing comedy, used a crack team of gag-men and a sober analytical mind to create the architecture of funny from the ground up, Laurel gives all the appearance of being allowed to just turn instinctively as the camera turns over. As with Jim Carrey, the joy is in his unfettered creativity in the moment. As Pyckle, pre-Pryde, he is firing on all cylinders in his facial expressions dealing with his colleagues and Julie Leonard as his assistant. The bonus, for those who’ve seen it, is in the mischievous lampooning of the most respected film remake starring illustrious stage star John Barrymore. In the main, the greatest Hamlet of his era was highly convincing as Hyde and channelled his performance with an impressive lack of prosthetics (other than extended phalanges and a late-revealed pointy skull). Barrymore’s wickedness though is matched by Laurel’s in mocking ‘the Great Profile’s slightly over-wrought metamorphosis into his alter-ego. Instead of his forerunner’s grasping of the throat and writhing, it is Pyckle’s legs that become supernaturally possessed after he downs what looks like a milkshake (Pyckle’s ‘58th variety’ spoofing Heinz’s 57 varieties) . He wobbles spaghetti-legged, kicks and spins laughably before throwing himself out of the window to land in a match-cut to a dummy that rivals Benny Hill for comedy obviousness. Surrounded by suitable period detail and costumes, from here Laurel hits the ground running, or rather squatting in mimicry of Barrymore’s bent-legged Hyde stride. He takes the physical absurdity further still by bouncing up and down on the spot like a frog when in the throes of maniacal glee. To top off the imitation, he reproduces Barrymore’s long dark wig and wide-eyed stare but exaggerates his mouth into a permanently demented grin. Stan’s comically evil Pryde is rendered by a skilled transformative performance just as free of external make-up aids as his dramatic rival. Where the comparison ends is in the bad self’s intention. Laurel spares us the slumming in dubious adult penny-gaffs for this demon, rubbing shoulders and other body parts with the lower orders like previous iterations. Mr Pryde is the amusing living embodiment of Pyckle’s child-like mischief, a Lord of Misrule more innocent than homicidal. Instead of the hideous trampling of the book’s small child, we get the stealing of his ice-cream cone; a woman is frightened by Pryde bursting a paper-bag behind her back. More cheeky spoofings of the 1920 version abound. Whereas Hyde attempts to ingratiate himself with a flower delivered to a young man at her door, Pryde embarrasses her by converting it into a party streamer blown in her face. The ground-breaking dissolve-shots of Barrymore’s metamorphosis are comically copied. Whereas Jekyll’s smooth hand is shown in close-up gradually becoming that of the gnarled Hyde, Pyckle’s hilariously morphs into low-budget pen daubings over his knuckles and veins. Laurel’s team also add their own ideas, extending Pyckle’s repeated accident-prone spilling of acid to the consequences if his dog was to eat food dripped upon by it. The result is the perfectly deadpan re-appearance of the pooch in his own fright-wig, forcing Pyckle to try concealing him against his colleagues suspecting his connection to the bestial murderer. The ending varies slightly according to different surviving prints. There is a nineteen and a half-minute version attributed to director Percy Pembroke (or Joe Rock and Scott Pembroke according to some sources) which ends with Stan’s advance on Leonard being met with a vase cracked over his head. Also there exists a two minutes-longer version (approved by a display card of the old British Board of Film Censors), directed by Harry Sweet, whereby after her rebuttal Mr Pryde loops himself intimately under Leonard’s necklace while his learned colleagues clamour outside for him – which then cuts inconclusively to an end piano credit. 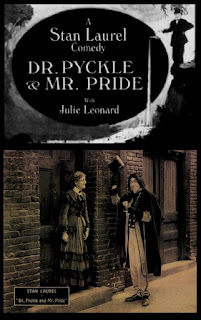 Dr Pyckle and Mr Pryde was the only comedy-horror send-up that Stan Laurel experimented with alone. 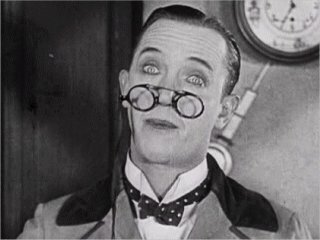 The theme of split-personality extremes would however be mined repeatedly in his future partnership with Hardy – for example his concussion-inspired transformation into posh Lord Paddington in A Chump at Oxford, his sudden bass (then female) crooning of ‘The Trail of the Lonesome Pine’ in Way Out West after Ollie coshes him with a mallet – and the unsettlingly funny playing of each other’s wives in Twice Two. What may also have inspired Stan during Dr Pyckle was the two conflicting faces of the public and private he had to wear during its making owing to debilitating domestic battles fought with his own common-law wife Mae Dahlberg. Simon Louvish’s invaluable biography Stan and Ollie: The Roots Of Comedy documents how Stan was forced after their vaudeville act ended to include Mae in his films despite her limitations of talent and looks compared to the belles of the day like Mabel Normand. He strained relations with his bosses by having her co-star status written into his contracts but ‘Behind the scenes, this clash of wills, and Mae’s delusions of stardom ate away at the foundations of the non-marriage, the ‘gentlemanly’ deal between Mae and Stan’. Soon, with the dissolving of Stan’s ties to Mae, his happiest of collaborations was to come. In early 1925 Oliver Hardy came to work for the Hal Roach studio. Now Laurel and Hardy’s paths would properly narrow to a comic collision of history-making movies together that would be their real lasting legacy eclipsing all their individual work.